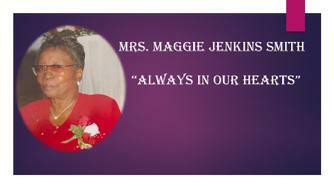 Mrs. Maggie Jenkins Smith, born to the late Harry “Buster” Jenkins and Audrey Rodd Jenkins, departed this life on Tuesday,March 12, 2019 at her residence in Varnville, SC. She was surrounded by her lovely family as she transitioned. Maggie was born on March 30, 1938 in Varnville, Hampton County, SC. She was educated in the public schools of Varnville, South Carolina. At an early age she joined the Samaritan Missionary Baptist Church, where she served faithfully as a Missionary and on the Samaritan Senior Choir, until her health declined. Before retirement, she was gainfully employed for many years as a dietician by Hampton School District One (Varnville Elementary School). Maggie was united in Holy Matrimony to the late Mr. Tommie Smith, Sr. To this union, nine children were born. Two children preceded her in death: Little Miss Margaret Smith and Mr. Paul E. Smith. In addition to her parents, one sister Emily Kelly; and 4 brothers: Marion Jenkins, Willie Jenkins, Louis “Sack” Jenkins and Larry “Jeff” Jenkins, preceded her in death. Mrs. Maggie Smith leaves to cherish fond memories four daughters: Rosa Campbell, Columbia SC, Mae Frances Smith, Ada Mae Capers (Charles Willie) and Linda Collins (Donnell), all of Varnville, SC; three sons: Tommie Smith, Jr., Robert Smith (Regina), Varnville, SC and Lt. Mark Smith (Valarie) of South Korea; A loving sister and brother: Ethel Ruth (Arthur Lee) and Joseph Jenkins (Beverly), whom she reared as her own children, all of Varnville, SC; three brothers: Harold Jenkins (Betty), New Hampshire, James Jenkins, Arlington, Va., and Donald Jenkins (Parthenia), Tampa, Fla.; two sisters-in-law: Sally Allen (Leon), Varnville, SC and Frances Singleton of Savannah, GA; one brother-in-law, Samuel Kelly of Cincinnati, OH; one special and devoted great granddaughter, Mikeala Smith of Varnville, SC; twenty Grandchildren; thirty-two Great Grands; five Great great grands; two devoted friends: Mrs. Ida Mae Williams,Varnville, SC and Mr. John Bostic, Jr., Brunson, SC; a host of nieces, nephews, cousins, former colleagues and friends – too numerous to mention.